Several weeks ago, I tapped into the energetic changes coming through as feeling like we were at the edge of something, slowing down in preparation to cross over from one platform to another. This week that point of crossing over is being illuminated. It has been strange times indeed, with tensions running high from the ever increasing waves of energy contrasting with days of calmness and deep peace. I’ve even found myself questioning the joy I’ve encountered, wondering if I’m missing something and then it dawned on me that this is exactly what the experience of crossing over is all about. It’s all in our perception, a change in how our mind interprets the existence we have around us. We are, of course, in the midst of a major energy portal flanked by the two eclipses which culminates with the Full Moon Lunar Eclipse this coming weekend. During this portal, there are massive openings available and some commentators have also mentioned that we are indeed coming to the end of a major phase in our evolution, the 2+ year bridging energy from 2012. We have it seems, emerged in a new world. A world of possibilities where a meaningful existence takes on a whole new extraordinary feeling. How do we tap into this world? We use our newly expanded Awareness to perceive it. As we move through this long and relentless journey of releasing old energy, there comes a time when we are so empty, so exhausted, so frustrated and dare I say, bored with the process, that we begin to question what it is we’re actually doing. But it is not until we give in and give up the continual desire to overcome the difficult feelings that we begin to understand how much has changed. We may not have even realized it but through the fog of confusion, upheaval and disruption, we have arrived somewhere new. It just takes a new and expanded way of thinking to comprehend it. The mind is a masterful tool but it can also hold us as its slave. It does not want to give up what is familiar and it’s the clinging to this rigid and limited sense of Being that this long process has been unravelling. But once we are free enough to retrain our minds to see through the Heart, this new energy opens up. We Feel it and it is here, permeating everything all around us. So while our physical and emotional bodies have taken a battering, the 5D energy is so joyfully and lovingly calm it’s almost ironic when compared to what we’ve been through. 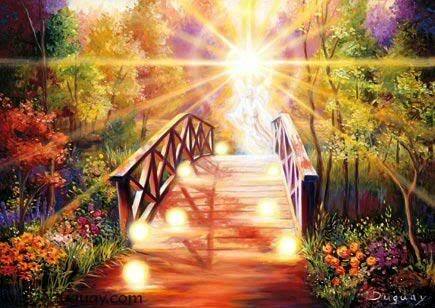 This is an experience we are all destined for, at whatever time is right for our own Awakening but for those of us in the here and now, the bridge has formed. We really are crossing over.